Castle Crenshaw, who tells everyone “call me Ghost,” is in 7th grade. He has been fast ever since he and his mom ran away from his father who was threatening them with a gun. Ghost is often on the edge of trouble, but really doesn’t want any, and doesn’t want to upset his mom. One day he watches a track team practicing, and stands up and races the runner he thinks is too smug. Coach offers him a chance to tryout and be on the team, but he has to keep up his schoolwork and stay out of trouble. He tries, but it is hard for him. Coach knows where Ghost is coming from and has been coaching for years to help kids stay out of trouble. 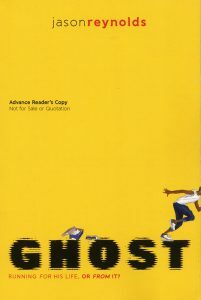 Ghost is an appealing character and readers will understand why he gets into trouble and how he sometimes reacts the wrong way. Coach is understanding, but also tough and Ghost knows he is serious about his conditions to stay on the team. This title is Book 1 in a proposed four book series titled “Track” and I am looking forward to the next book. Reynolds, Jason. Ghost. New York: Atheneum Books for Young Readers, 2016.